The NDB Group's Profit After Tax for the third quarter ended 30 September 2010 grew significantly by 83% over the second quarter of 2010. The NDB Group's growth in Profit After Tax for the third quarter of 83% also compares favourably with the growth in Profit After Tax for the second quarter, which was 44%. 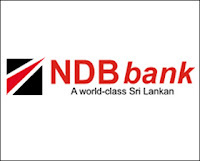 The financial conglomerate's improved performance further substantiates the stability of the NDB Group that has been evidenced by Fitch Rating Lanka Limited affirming a rating of "AA (lka)". The 14% growth in NDB bank's core banking profits (excluding exceptional gains made in 2009) confirms that its core business is being sustained under the improved economic conditions that are being experienced at present. On the same basis, Profit After Tax also grew by 17% over the corresponding period last year. Though the core banking profits on an as is basis reflects a decline of 12% over 2009, this gap has declined from 22% as at the end of the second quarter. Similarly the gap in Profit After Tax has also been systematically reduced from 22% as at the end of the second quarter to 14% at the end of the third quarter. The Bank's gross lending portfolio grew significantly by 16% from Rs. 56.1 b as at the beginning of the financial year to Rs. 65.1 b as at 30 September 2010. This significant growth of 16% compares well with the industry growth of 10% as at 31 August 2010. It is noteworthy to mention that all business segments of the Bank grew satisfactorily with project finance, SME, retail and trade finance accounting for a major share.Customer deposits grew 18% over the last 12 months from Rs. 44.3 b as at 30 September 2009 to Rs 52.1 b, and was 4% over the last financial year end. NDB Bank's Tier 1 Capital Adequacy Ratio of 12.68% and a Tier 1 & 2 ratio of 14.85% are well in excess of the regulatory minimum of 5% and 10% respectively. The stringent policies adopted by the bank to maintain a high quality portfolio resulted in the Bank's ratio of Non Performing Loans (NPLs) to the gross lending portfolio improving from 2.58% as at 31 December 2009 to 2.08% as at 30 September 2010. Due to the above, NDB Bank's NPL ratio remains one of the healthiest in the local banking industry, and compares very favourably with the industry NPL ratio of 6.7% as at 30 September 2010. The Bank's Open Loan Position (Non Performing Loans - Loan loss Provisions, divided by Shareholder's Equity, i.e. NPL's not provided for as a percentage of Shareholder's Equity') which signifies the stresses on un-provided NPL's on the banks equity was 1.70% and also compares very favourably with the industry Open Loan Position of 28%. The operating costs of NDB Bank increased by 14% over the corresponding period last year, which was partially influenced by inflation and to a greater extent resulted due to measures initiated to increase capacity and reach. However, NDB Bank's cost to income ratio of 43% for the period compares favourably with the industry ratio, which is in excess of 50%. NDB Bank expanded in SME lending through its presence in the newly opened five branches in the Northern and Eastern Provinces focusing on sectors such as fisheries, manufacturing, hotels & tourism, agriculture, commercial transportation and trading, with a view to rebuilding the communities in post war Sri Lanka. With this view to build sustainable livelihoods, NDB Bank launched its latest SME banking scheme, 'NDB Divi Aruna'. The Divi Aruna scheme will enable entrepreneurs take on the challenges of post war Sri Lanka by providing the much needed capital with flexible repayment terms at an attractive pricing, with convenient accessibility. Further, NDB Bank has taken the lead by approving and disbursing highest number of loans under the Small and Medium Enterprise Regional Development Project (SMERDP). Among the participating Banks of the scheme, NDB has taken the lead by approving over 40 facilities for the 1st quarter of 2010 covering all the Provinces of the country including the north and east. In a bid to empower youth and stimulate further economic regeneration in post-conflict Sri Lanka, NDB Bank introduced the NDB Jeevana Livelihood Training/Loan Scheme. This pioneering scheme, an industry first, is targeted at youth aged 18 - 35 in both the north and east of the island. The NDB Jeevana Livelihood Training/Loan Scheme is an innovative initiative that couples a livelihood training scheme with a special personal loan that will be issued at a very concessionary rate with a grace period for payment, making the scheme more accessible. NDB Bank announced a comprehensive communication campaign in the month of September, with a view to enlightening those who consider saving, but feel that it is impossible given their day to day expenses. Extending the thought process beyond traditional monetary savings, the NDB Bank's 'ithiri karamu, api hademu, rata hadamu' Savings Drive aims to highlight the potential benefits of cutting down unnecessary waste that takes place in ones day to day lives. Savings made in these aspects will translate to a financial saving in the long term, helping to build a brighter future for individuals as well as the nation. In this light, NDB Bank has taken the initiative to publish a handy 'Saving Booklet' that offers useful tips on how to optimise the benefits and minimise waste of common everyday essentials via the discounting of continuous unconscious wastage of national resources. The NDB Group differentiates itself from its peers, as its customers have access to a full range of banking and financial services, including project and infrastructure finance, SME lending, retail banking and corporate banking through NDB Bank; while it also offers a wide spectrum of products and services in the areas of investment banking, stock broking and wealth management through the investment banking cluster, and insurance solutions through AVIVA NDB Insurance. A very strong and healthy balance sheet, capital and liquidity, supported by its talented and committed team, positions the NDB Group to grow aggressively as a dominant force in the financial services sector.